Pork Pie drums is a fast growing American drum manufacturer based out of Canoga Park, California. You get a sort of mom and pop shop feel with this company. In 2006, the company had only 9 employees and the founder would sign each drum stamping it with its date of manufacture. Their piglite acrylic lines are manufactured in California. The Little Squealer kits, Pork Pie's most successful line, are made in Taiwan. Pork Pie drums also offer a line of signature snare drums as well as their own hardware. Pork Pie was started by Bill Detamore in 1987. He started off just by making drums as a hobby. After selling a few kits, the company developed into a complete drums manufacturing center. Keep in mind that the prices listed here are just a general ball park. Each retailer's price may vary to some degree due to promotions, or sales, or whatever. Today it's a common practice to sell "Shell packs", meaning that no hardware is included. These, obviously, can be found for less than an entire kit with hardware and goodies included. The toms have a real nice tone and resonate very well. There is a lot of clarity. The floor tom gives you some slight boominess but its actually quite controlled. The snare has a bit more "darker" tone that most other snares but its still very crisp in the attack and unique in a good way. It just cuts through in a lower register. The bass drum gives you a real fast solid punch. It's very quick. I really like the overall sound of the Little Squealer. Pork Pie's little squealer kits are made with all Maple shells and come with Pork Pie's hour glass shaped lugs. 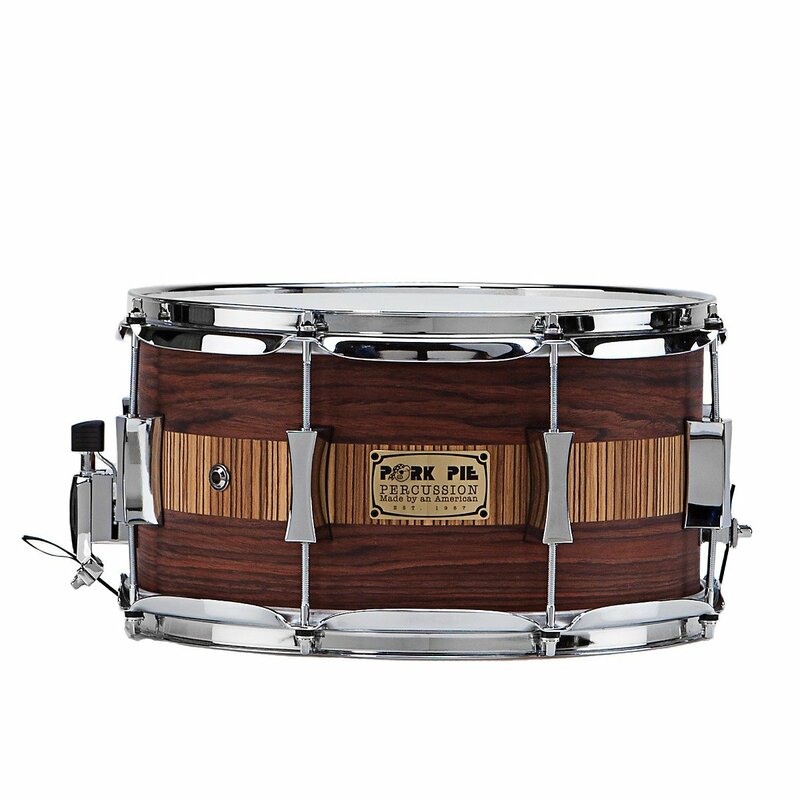 Pork Pie drums introduced the Rosewood Zebra snare which comes in the Rosewood Zebra Satin Oil Finish. The shells are made with all U.S. Maple shells though and finished off with the classic Pork Pie hardware. The Pork Pie drums Blood Red Sparkle Lacquer series is made with all Maple shells with Pork Pie's progressive ply design. The series is finished off with chrome hardware, Pork Pie exclusive lugs and Remo heads. A 14" x 14" floor tom and matching 14" x 7" snare are also available as add-ons. The Pork Pie Blood Red Sparkle Lacuer comes with 10" x 8" and 12" x 9" rack toms, a 16" x 14" floor tom, and a 22" x 20" bass drum. The bass drum gives you a real solid punch and also resonates a bit fat but in a much lower tone. The snare is very bright with a nice tone. It is extremely crisp and cuts through effectively. Think "St. Anger" by Metallica. I would get an O-ring to control the "pingy" resonance. Aside from that, this is a great sounding kit. 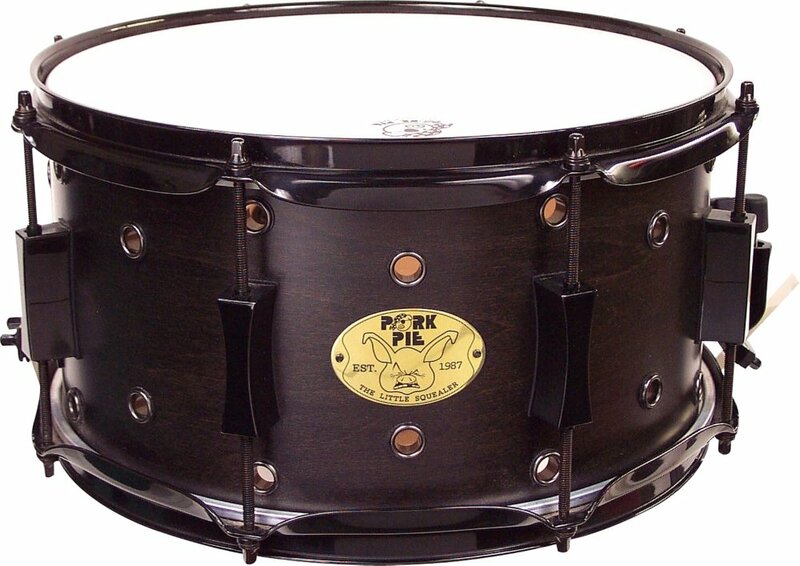 Ebony Satin Squealer series is made with all Maple shells with Pork Pie's progressive ply design. The series is finished off with black chrome hardware, Pork Pie exclusive lugs, and Remo head. The 13"x7" is crafted from 8-plies of maple, and 2.3mm heavy-duty hoops. The company can also custom cut your drums edges. They also offer separate add on toms, custom snares and a wide range of hardware. Pork Pie drums are well known for their craftsmanship and their high quality in every detail. Pork Pie has joined the mainstream of other drum manufacturers and bring some real unique products and sounds to the table. The only drawback is their prices may be out of reach for beginning drummers with a modest budget. Maybe some more entry level sets will be in their future. For the products they do have, they are a solid company and a real competitor in the world of drum manufacturing. Do you own Pork Pie Drums ? Let's See Them !